German Shepherds are extremely dominant by nature. They rise above and jump because they want to show their power to others. This is a typical alpha behavior in GSDs but not a favorable one when you have a German Shepherd as a pet in your home. To make your GSD learn some etiquettes and manners, you will need to invest time in its training. Training is most effective when your GSD is just a pup. At a few weeks of age, it will adapt to your rules and commands and will grow to become a well-mannered and obedient house dog. Having a strong, active, and dominant dog in your home can become a problem sometimes when it starts to show signs of destructive behavior. Your hyper GSD pup will try to mark different areas of your home as its territory. This is not an abnormal behavior as GSDs are born to be dominant and lead the pack. Similarly, when a GSD lives with humans, it will look at other family members as part of the pack of which it is the leader; i.e. alpha. When it takes the position of the alpha, it does what it wants, including jumping on people, furniture, and much more. To prevent your GSD from jumping on the furniture, you will need to take the position as the alpha of the pack. Taking the alpha position when your dog has already succeeded in dominating the pack will be difficult. However, if you dominate and become the authoritative figure of the family when your dog is a few weeks old, it will come to you and let you dominate. It is extremely important to set yourself as the leader of the pack or else your dog won’t follow your commands and will disobey you. You can take the position of the leader by commanding your dog in an authoritative tone of voice. Use hand signals and a firm body language to tell your dog that you are the boss. If your GSD is jumping on the furniture and destructing everything in your house, then this is a problem that might have been encouraged by you in the first place. As little pups, GSDs are extremely adorable, and that’s why their owners don’t stop them from jumping on people or furniture. When you let your GSD jump as a pup, it will feel encouraged and continue doing so. 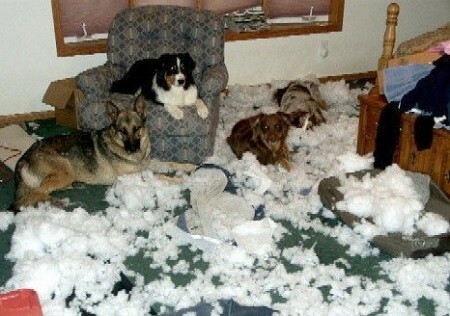 This is a mistake that owners make and then get irritated with their dogs when they break the furniture. Do not appreciate your dog when it jumps at you or the couch. By encouraging this behavior, you are letting the dog take control over you. 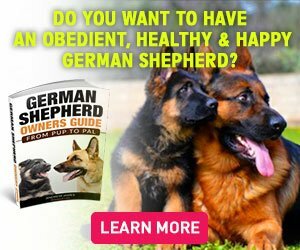 Soon your dog will take the position of alpha and dominate over you. This is the way GSDs usually get out of hands and create problems for their owners. When you see your dog jump on you or the couch, react immediately. Adopt a polite yet authoritative tone and tell your dog to ‘stop.’ You can also use voice commands like ‘No’ and ‘Stay’. You enter the home after a long day at work and see your room turned upside down, the leather of your furniture scratched, and much more. You wonder if it someone broke into your home or what and there in the corner you find your dog with a pillow in its mouth. You get furious and shocked at your dog’s behavior and are wondering what went wrong with it. This is a common problem that GS owners face. If your dog was encouraged to jump when it was a pup, don’t get surprised if it destroys your furniture and household items. Tell your dog that everything in the house belongs to you. 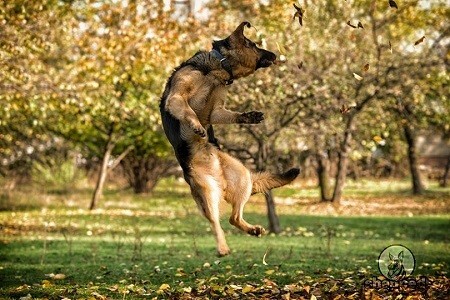 Your GSD’s jumping is getting out of hands, and you need to fix the problem. The best thing to start with is to set some house rules that your GSD will need to follow. If you don’t like dog hair on your couch, make sure you convey this message to your dog. To train your dog to stay away from furniture you will need to follow some simple tricks. Get a leash, a clicker, and some treats. Put the leash on your dog and sit on a sofa that you don’t want your dog to be on. Have a treat in your hand or a food item. You can also place the food item on the sofa. This will encourage your dog to jump on the sofa. Remember, you want your dog to make a mistake so that you can correct it. Also, use hand signals and point on the floor. If your dog gets off, wait for a second and offer a treat. Treat will be a sign of appreciation for your dog when it doesn’t jump on the furniture. Repeat this exercise until your dog starts to understand the trick and learns that furniture is not for it to sit. Do not use the ‘Down’ command for telling your dog to stay away from the furniture because ‘Down’ is a command that is used to tell your dog to lie down. Don’t confuse your GSD by using multiple terms during the training process. Set house rules and continue this activity with other furniture of the home. Adopt a polite yet authoritative tone to tell your dog to stay away from the furniture. Do this for your bed as well. Reward your dog every time it follows your command and stays away from the furniture. You GSD will love to sleep in your comfy bed and soft couches. If you don’t like this behavior, start training your dog during its housebreaking period. Make sure that your dog is trained to obey the rules in your absence or else you’ll find your bed covered in dog hair.